Only one man ever understood me, and he didn’t understand me. Humanity may endure the loss of everything; all its possessions may be turned away without infringing its true dignity – all but the possibility of improvement. 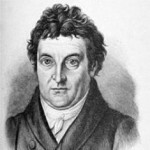 Johann Gottlieb Fichte was born in Rammenau, Saxony, Germany. He was a German philosopher who became a founding figure of the philosophical movement known as German idealism, which developed from the theoretical and ethical writings of Immanuel Kant. He was also the originator of thesis–antithesis–synthesis, an idea that is often erroneously attributed to Hegel. He also wrote works of political philosophy; he has a reputation as one of the fathers of German nationalism. He studied at the University of Jena and Leipzig University. He wrote several books include: An Attempt at a Critique of All Revelation, Foundations of the Science of Knowledge, Foundations of Natural Right, The Vocation of Man, The Vocation of the Scholar (with Allan G. Bluman), and Addresses to the German Nation.